As we have processed our finds from Johnston's Pond we have found a number could be re-constructed to form a nearly complete vessel. The photograph shows a stoneware 1 gallon flagon with the embossed name of J and JE Phillips, Royston Brewery. Missing a couple of side wall pieces and the looped handle, it shows the effect of being buried with lots of rusty cans. Robert Phillips started the business in 1725 but it was sold to Greens of Luton in 1949, although it operated as Greens wine and spirits subsidiary in 1952. It appears to have still been listed in the telephone directory as recently as 1962. As we dig deeper at Johnston's Pond it becomes ever clearer that we are dealing with a waste tip deposited within the brick structure. Some of the finds lie beneath the collapsed brickwork and include lots of bottles and jars, rusted metal cans and so on. We even have a rusted clock and a bicycle bell!! The photograph shows one of the bottles, still containing murky liquid. It is an example of the unusual Codd bottles, designed to hold fizzy drinks. Invented by Hiram Codd of Camberwell in 1875, it used an internal glass ball to seal its contents. Gas pressure forced the ball against a rubber ring in the neck and to pour out the contents you had to press the ball down with a special wooden tool supplied with the bottle. They were in use from 1875 to around 1930 in this country. The embossed makers name is CRAMPTON and CO who were active in Newmarket and Sawston in the 1920's. UPDATE: In 1861 John Crampton set up two bottling plants, one in the High Street, Sawston and the other in Park Lane, Newmarket. The Sawston plant closed in 1928 but the Newmarket one carried on into the early 1960's. Another two eventful days at Johnston's Pond. As we dug down further it became obvious that the N-S wall was actually bonded into the E-W curved wall after all. The broken brick joint was caused by the whole wall leaning inwards at the top, either as a result of pressure from the weight of the clay bank behind it or when the wall was broken. Continuing downwards, a large piece of intact brickwork came into view which looks like it might come from a corbelled roof to the structure. 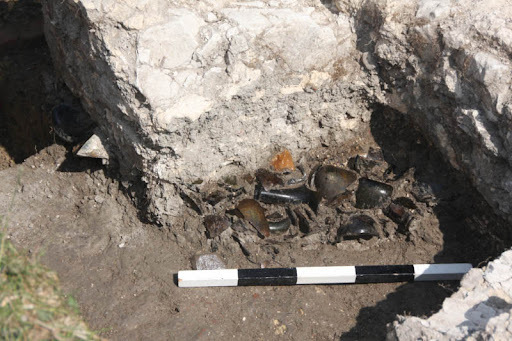 In amongst the demolition debris we found a number of glass vessels - some unbroken like that shown in the photograph with its stopper intact and some contents visible. It is an Owbridge's Lung Tonic bottle - this cough medicine was invented in 1874 but carried on being made until 1969 - so not much use as dating evidence!! The rest of the glassware has a very 1940 - 50's look about it and this may be the period when the structure was demolished. But by whom? If this mid 20th C date is correct why are there not records of the structure there. We are carrying on, although the depth of the trench may force us to stop. There is certainly no sign yet of an outlet. Our dig of 2 weeks ago produced 2 walls and several unanswered questions, therefore we were out at Johnston's Pond again seeking more information. What we actually got were more questions!! We carried on digging near the curved wall (which runs east-west) and its presumed return wall running north-south. However, as the photographs shows, the curved wall cuts through the north-south wall. There is no mortar sealing the joins between the two so the structure would not have been water-tight. In addition a section of joined-up brickwork lying in the bottom of the trench was not a floor. This leaves us with several questions - does the north-south wall carry on south of the curved wall? If so, how far? Also the north-south wall itself is curved as the angled bricks in the photo show. What lies below the block of bricks - is there a floor further down? The net result is that we have more work to do and hope to carry it out this coming weekend. If you are interested do come and see the mystery wall - we might have an answer then. Well, what a successful weekend. After hacking our way through the jungle we started investigating the isolated bricks on Saturday. This revealed a debris field of lots of bricks, broken ones as well as complete ones, which appear to be late 18th/early 19th C in date. As we dug down we started to reveal the beginnings of a wall in the middle of the cut in the pond bank. More bricks to the north of this on the edge of the bank leading down into the pond were more jumbled but appeared to be another wall. Sunday was very eventful - the southern wall kept going down (12 courses of brick to date) and surprised us by being curved lower down (see the photograph) with a return wall on the eastern side. This is a substantial piece of work and we can only guess how deep the brickwork goes. No sign yet of any outflow pipe, but we are still well above the pond water level so not unexpected. Angus Wainwright will visit to decide how to proceed - we are already 1 metre below the bottom of the original cut. More information as it arrives. While digging we were astonished by the number of butterflies, such as marbled whites, meadow browns etc, flying around. The photo shows how camouflaged they are set against a meadow grassland background. There were also quantities of pyramidal orchids flowering together with a few bee orchids (see the Facebook page). It is so good to see such a varied environment with its attendant wildlife doing so well at Wimpole. We have now finished the survey work on site and the trenches will be filled in next week. The many pieces of yellow ceramic floor tile from the 18th century extension have been kept to allow us to play jigsaws to determin the size of the slabs. 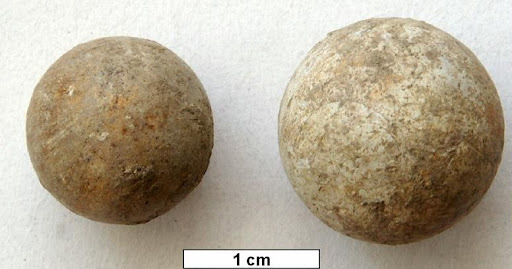 More finds have been photographed including these two ceramic balls which could be early 'marbles'. We have yet to finish the site survey, problems with GPS equipment have held us up. Hopefully the site work will be completed this week and the trenches will be backfilled next week. 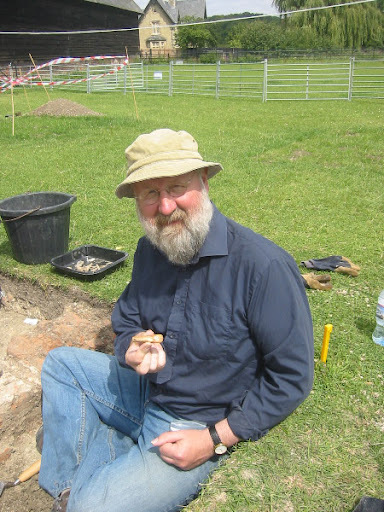 There are still plenty of finds to be washed and identified at Barhill on wednesday evenings. Two weeks after we stopped excavating and we have nearly finished all drawing and photography. This has been the year of the wine bottle, from one context alone there are well in excess of 30 bottle necks of early 18th century date. The photos in the gallery show a very small selection of other finds - more to come soon. 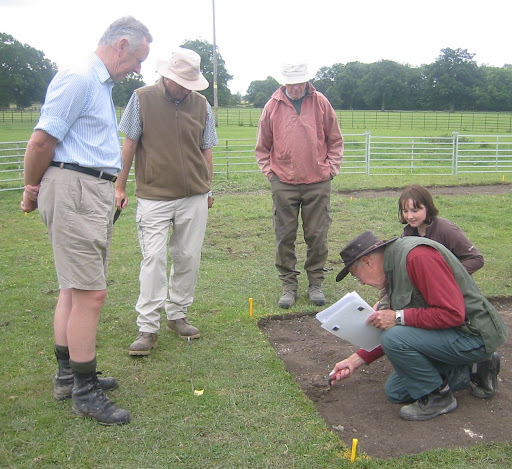 We are begining the long task of analysing the finds from this year's excavation. 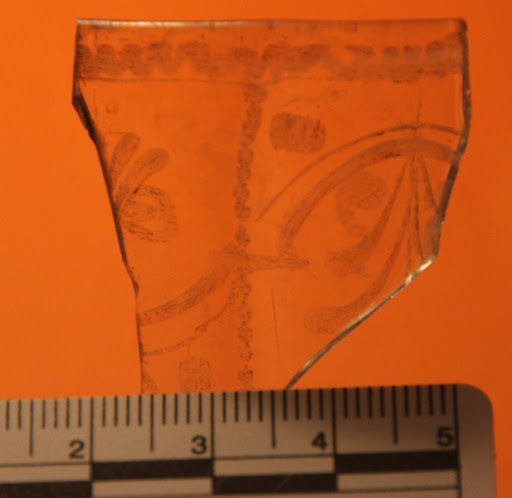 There is a lot of glass, window and vessel, including a nice rim of a glass with an engraved pattern - a poor photo at the moment but we will take some better ones soon. After nine days of excavation we have completed what we had hoped to do this year on Mr Radford's house. There is clear evidence of medieval occupation, pottery and possibly a large clunch chalk wall, replaced by a 17th century timberframed long house on a red brick wall, and then in the early 18th century an extension to the west re-using the earlier clunch foundation. The south end of the 17th cent. house has a brick gable end with an inglenook fireplace. Now comes all the work sorting finds and writing an interpretation. Perhaps now like the 17th cent. occupiers we can have a glass or two of wine! The picture used yesterday showed the red brick wall of the 17th century house. We now think this foundation was re-used, and sits on a large clunch foundation built in the Medieval period. So our house built with red brick walls is now seen to partly overlie an earlier clunch wall. Very nice to see a new member making an interesting find in today's picture. We have now uncovered the massive brickwork of the gable end of the house and and projecting into the room (north) is brickwork forming the east side of an inglenook fireplace. 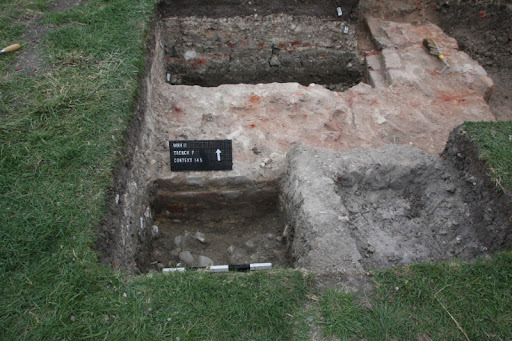 The red brick walls of the 17th century house have been found plus a large extension on the west side built with a clunch wall and clunch under floor (clunch is a hard chalk) layers relating to the underlying medieval house are now appearing. The walls and floors of the 17th century house are now showing and we have discovered a large, slightly later, extension on the western side. New finds include some interesting, hopefully datable pottery. 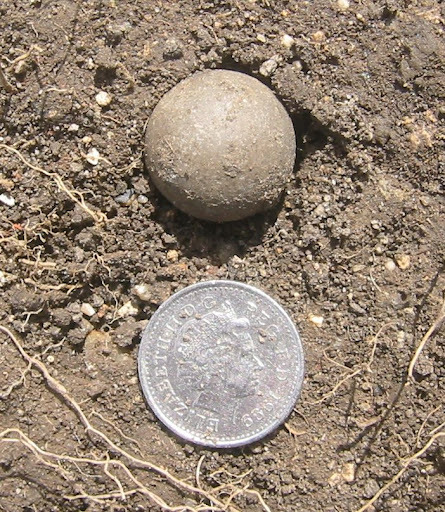 We are underway with our excavation and here is one of our early finds, a ceramic ball. Is this a toy or for a board game? 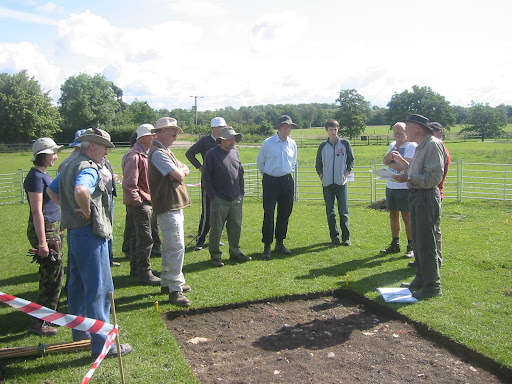 The excavation begins - briefing for diggers on day one. CAFG have been carrying out excavations at Wimpole Hall near Royston since 1999 at the invitation of the owners National Trust. In 2011 we revisited Mr Ratford's house and have discovered a great deal more about the house's history. For more information, see our original proposal, the latest news about what we found in the Wimpole news archive and our gallery. A large collection of wine bottles found at Wimpole. 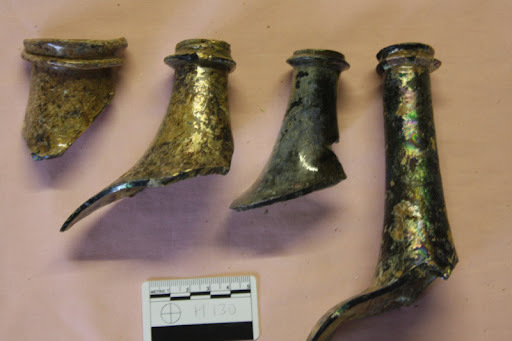 A report on some rather unusual thimbles found during the excavations. 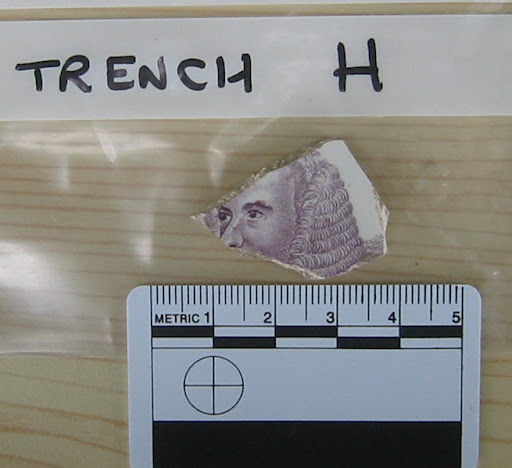 A summary of our earlier excavations (1999-2009). 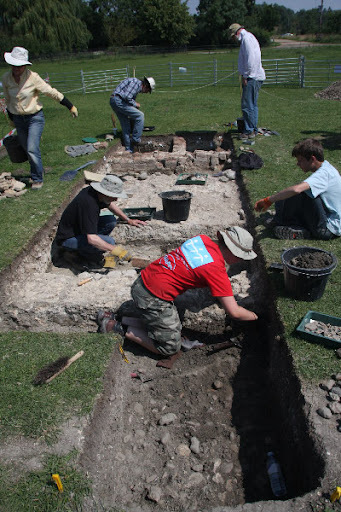 The excavation is underway - trenches set out and turf removed on 16th and 17th July. Come and see us from the 23rd to the 31st July.